The printed organ is made of synthetic material designed to mimic the structure and function of native tissue. It is not designed to replace failing human organs, but it can be used for scientific studies, something that is expected to rapidly increase research on new medicine. The medical breakthrough may also allow scientists to rapidly design organs-on-chips to match specific disease properties or even a patient’s cells. Organs-on-chips, also known by the more technical name microphysiological systems, replicate the structure and function of living human organs. Each is made of a translucent, flexible polymer that lets scientists replicate biological environments of living organs. The chips are also clear so that the scientists can see an inner-working into how the organs work. 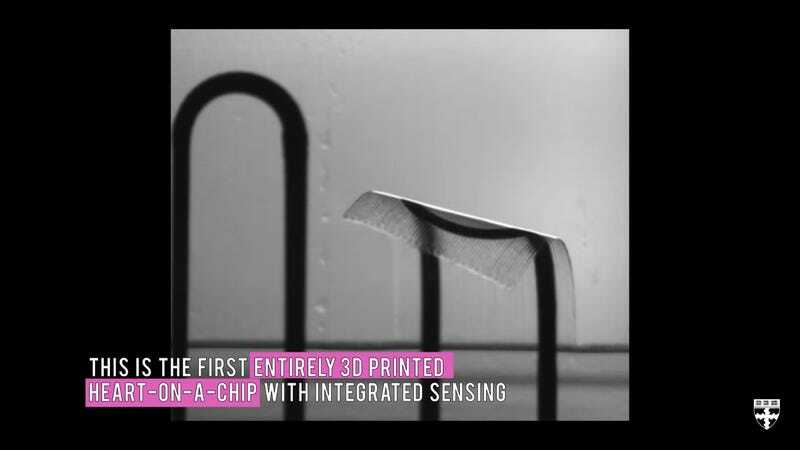 A large part of the breakthrough was actually developing six different printable inks capable of integrating sensors within the tissue being printed. In one continuous printing process, the team 3D printed materials into a heart-on-a-chip with integrated sensors. The sensors were capable of measuring the beating of the heart. For now, the chips are only able to replicate the architecture and function of lungs, hearts, tongues, and intestines. In June, Harvard’s Wyss Institute for Biologically Inspired Engineering developed a lung-on-a-chip programmed to mimic a human lung. The heart is the most advanced organ-on-a-chip yet.